There’s always an Ashes cash-in game. The latest is somewhat unsurprisingly titled Ashes Cricket 2013 . Only it’s not out yet. As far as we can tell, they decided they’d make the game from scratch, rather than doing the usual thing of updating the database and recording three more lines of commentary for the previous version. As a consequence, it isn’t finished. They’ve basically said that they could have released it, but after giving it a quick go, it turned out to be rubbish. That’s unusually considerate of them and fortunately the 2013/14 Ashes provides a second deadline, so maybe something will appear then. Sadly, there is further bad news in that the game will feature official licensed Australian and English cricket teams, so there won’t be any amusing near-miss names. 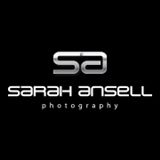 No Shaun Whiston. No Bert Jackson. No Jenny Bristow. No Kelvin Pieterswoggle. Do you want to know who the best players are for a Cricinfo fantasy IPL team? It’s whoever happens to be playing today. That’s the game. You have a ridiculous number of transfers open to you, so the game is basically just to go into your account daily to transfer players. It’s not about picking guys you think will perform well; it’s about staying on top of things. It’s about checking the fixture list and ensuring you have the maximum number of players appearing each day. You know you’re having a bad week when you’re this angry about the rules of a fantasy IPL game. You might say we should get some perspective, but that isn’t the problem. This isn’t what we’re annoyed about. This is just overspill. It’s December the 24th and we’re feeling festive, so we’re going to write about everyone’s favourite pastime – administration. 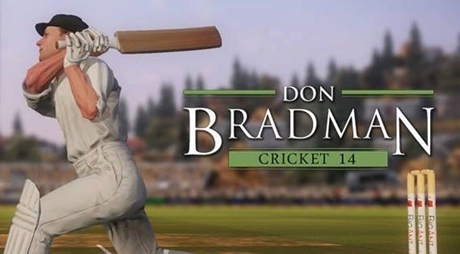 In short, we have a demand: all potential cricket administrators should be forced to play four seasons on a cricket management game before they can be considered for any job. We reached this conclusion after downloading a trial copy of the latest version of what was originally Marcus Trescothick’s Cricket Coach last night . We started a new game, decided to be England and were immediately confronted with a World Twenty20. This caused us to sigh wearily. This always happens in cricket management games (International Cricket Captain is the other). Basically, the games suffer not because of how they are made, but because of what they are trying to simulate. Turns out managing an international cricket team is REALLY BORING, because you’re forever competing in some no-mark tournament or tri-series that you don’t give a toss about. If cricket administrators had to play through the repetitive formulaic shenanigans of a five-match one-day tour of India – picking pretty much the same bloody team again and again and adopting the same bloody tactics match after match – they would know not to schedule two such series within the space of 12 months. When it comes to measuring the sporting value of a fixture, the ‘skip match’ option is a very accurate barometer. Happy Christmas to those of you who live in a country where that’s meaningful. Have an equally Happy December 25th, the rest of you. 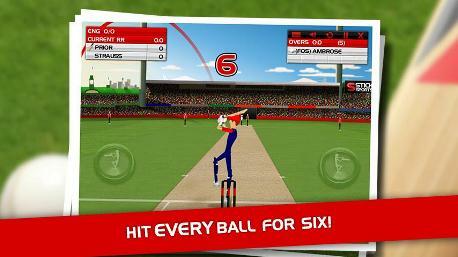 Not as good as android cricket now being available on a stick. 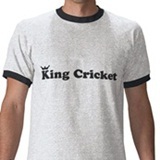 Yes, that’s right, today’s entire King Cricket offering is a limp one line joke based around our love of robots and our luddite attitude to mobile phones. We haven’t even explained what Stick Cricket is or included a link. That’s how lazy we are. 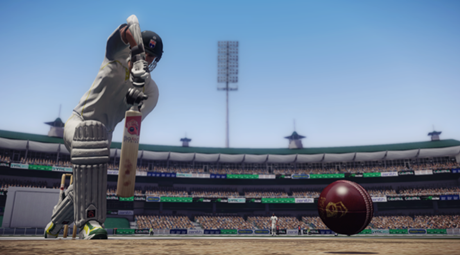 International Cricket 2010 is a rubbish name, but it’s a great game. 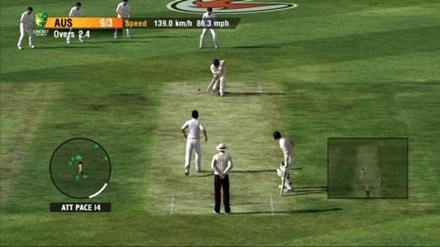 The batting in Ashes Cricket 2009, the last version of this game, was excellent. It’s now slightly better with greater control of each shot’s power. If you don’t try and knock the leather off the ball, you’ve less chance of getting out. You work your way into the game taking singles, before unleashing drives and pulls when you’re well-set. Specialist batsmen are less likely to edge or miss as well, so you’ll find yourself marshalling the tail. These developments make batting more tactical. They make it better. The bowling was decent in Ashes Cricket, but not great. It’s far better now. The huge leap forward is in the fact that the opposition batsmen don’t suddenly think they’re in a Twenty20 match after eight overs (unless they are). It seems all the more realistic for that. You find you really have to work for your wickets too. You can’t just keep bowling full balls, because the batsmen seem to get wise to it. You actually have to set the batsman up, trying different ploys to get the better of him. How about a career mode? Our one reservation is that playing a Test match is pretty arduous. The tactical side of things is great, but you quite simply can’t be bothered playing as all 11 batsmen. It’s fun for a bit, but after half an hour, you really want a bowl, so you skip the innings. Why do you have to play as every player? The game would be infinitely more engrossing if you had just one player under your control. First of all, your player could develop over time, giving the game a narrative and keeping you hooked. Early in your career, you would bat down the order and get a few overs and then according to how you performed and how you chose to train your player, you might get more responsibility. Having one player would make each match a more manageable size, as you’d only play the parts you were involved in. It would also mean that you encountered different situations. Maybe you’d come in to bat needing to score at five an over; maybe you’d need to bat time. Maybe you’d come on to bowl needing to take a wicket or maybe you’d need to keep the runs down. Training would be a great addition. Your player’s batting would be poor at first and you’d struggle to middle the ball, but as you progressed, he’d get better and you could start playing more shots and longer innings. As a bowler, you’d get fitter, more accurate and maybe quicker. You’d also learn new skills or refine existing ones: doosras, googlies, swing, reverse swing. All of this would make a game more absorbing and it would give the player a reason to keep playing. We’ll settle for five per cent of all profits if someone makes this game. Ta. Until then, International Cricket 2010 is about as good as you’re going to get. Buy it from Amazon . “Play as Freddie Flintoff and engage in long, soul-destroying rehabilitation programmes that are ultimately unsuccessful. Slowly come to accept that your days as an international cricketer are behind you, even though you’re only 32. You can order it in advance and still have time to waterproof your Nintendo DS so that your salty tears of sympathy don’t knacker it up for when you want to play Club Penguin . The 2010 version of International Cricket Captain is out. It’s a good game, but pretty similar to the 2009 version really. Our ICC 2009 review should tell you everything you need to know if you’ve never played the game before. Other than that, we want to voice a gripe. To be clear, this is borne of playing this game for many, many hours, so it’s not a diss. Our gripe is with the micromanagement. It feels a bit like two different games. There’s the side of it where you’re signing and training the players, managing the club and selecting the team. Then there’s the side of the game where you’re telling the bowlers where to bowl and setting the field. We like the first part. We don’t like telling Steven Finn to bowl short and straight for two different batsmen every single time he comes on to bowl. It gets boring. Nor can we bothered changing the field by the time we get to 2015 – but we STILL want to see whether our young fast-bowling all-rounder is going to turn into Garry Sobers or not and we endure endless matches, going through the motions with our match orders in order to find out. Is this a review? Not really, but we feel a bit better now. Buy ICC 2010 here or download the free two-day trial. We did our live review of International Cricket 2010 on Twitter. Ceci Masters kindly documented the review/mental breakdown in full and it can be seen here. If you want to keep tabs on our ongoing descent, you can follow us @TheKingsTweets. We probably won’t be doing another live review of International Cricket 2010 though, we’ll say that much.